You are currently browsing the tag archive for the ‘Embracing Encaustic’ tag. 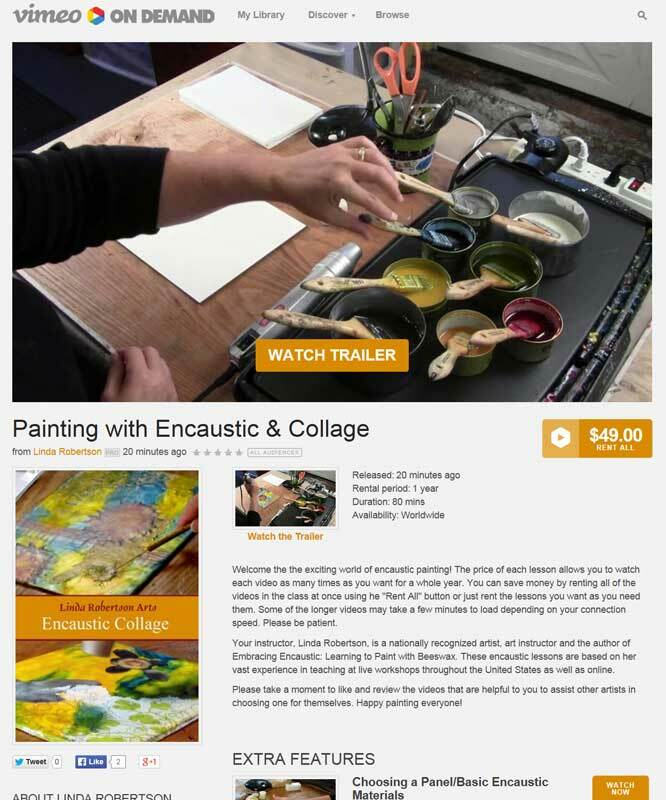 You may have heard that the new edition of my eBook, Embracing Encaustic: Learning to Paint with Beeswax, is now available for instant download. While this is an updated version of the printed version, there are also 35 exciting new artists who share their work as well as reveal their personal painting methods and explain why they are compelled to make the work they do. Get the book here! If you aren’t a regular reader of eBooks, never fear! Follow these easy instructions on how to download and read my eBooks. The big surprise is that there will be two eBooks instead of one, both under the Embracing Encaustic title. This allows a total of 70 artists to be included between the two books while keeping downloads manageable. The second eBook, Embracing Encaustic: Mixing Media, will have all new techniques and will be available within the next 2 months. 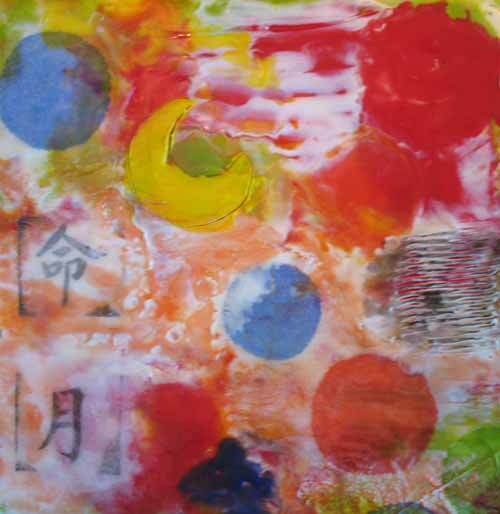 The artists represented in the pages of my Embracing Encaustic eBooks were gracious enough to allow me to share their work with you, and for that I am forever grateful. These books wouldn’t be nearly as interesting without their vast talents and generosity. I’m so excited to share their work with you! Amy Royce, Andrea Benson, Ann Huffman, Bethany Handfield, Bridgette Guerzon Mills, Debra Claffey, Eileen P. Goldenberg, Emily Rutledge, Eva McCauley, Geoffrey Kostecki, Gretchen Papka, Janet Amundson-Splidsboel, Jeff Juhlin, Johanna Gardner, Judith Williams, Kara Brook, Kellie Weeks, Kevin Frank, Kimberly Kent, Kindra Crick, Linda Robertson, Linda Widstrand, Lisa Sisley-Blinn, Mary Farmer, Mary Mettenbrink, Mitchell Visoky, Norman Soskel, Patricia Dusman, Rachelle Kaldani, Robin Samiljan, Sally Arnold, Serena Barton, Sherrie Posternak, Stephanie Hoff Clayton, Tracy Spadafora. It’s been way too long since I sent out an update on what’s happening with my art and my life but honestly I wasn’t really sure what to say. Those of you who follow me on Facebook may know that the past several months have held a lot of challenges for me including major changes to just about every part of my personal and professional life. I’ve moved my home and studio, I’m single again after 20 years (yikes!) and am taking back my given name of Linda Robertson. I’ll use Linda Robertson Womack for a while so you’ll see that transition happen gradually, but I’ve already activated the web address for lindarobertsonarts.com. Baby steps, right? All of these changes have dramatically slowed the many projects I was working on last year and I’m just starting to get everything back on track now, but I thought you’d want an update even if it’s not all worked out yet. Read on for what to expect in the coming months. I also want to thank so many of you who have sent me words of encouragement over the last few months. I’ve read every message and responded to as many as I could but I know I missed some of you and for that I apologize. Your words have helped me more than you know and I truly am grateful for your good thoughts. Wait, didn’t you just move your studio last summer? Why yes, yes I did. Then I bought a new house in completely the wrong direction from the new studio. The good news is that now I have a great studio space at home less than 5 miles from my long time Stark Street studio so it should still be convenient for everyone. Here’s a photo of what it look like now. I’ll be working hard this week putting on a few finishing touches. Speaking of classes, I just posted my full summer schedule which includes two Wax Week classes in Portland. I’ll offer a 5-day class exploring Encaustic & Photography in June and another 5-day class on Mixed Media in July. Seats will be very limited so if you’d like to join in don’t wait! Ah yes, the eBook. This project really got hit hard and has been long delayed. I’ve been in contact with the amazing artists who will be featured in the eBook and they have been extremely supportive of my new circumstances. I won’t try to give you a publishing date just yet but I will say this will be the top priority for me once my studio is settled so it’s coming soon, I promise! Thanks to all of you who are so excited to see the new version. I’m pretty excited to see it myself. It’s making me crazy that I had just finished filming the new surface design class when everything went south. It turned out really well and I can’t wait to share it with you. I still need to get it edited and write all the class notes which will take some time, but I’ll get it online as soon as I can. Great news! I’ve decided to reissue my book, Embracing Encaustic: Learning to Paint with Beeswax, as an electronic book (eBook) for the third edition. This will allow me to create a more comprehensive and less expensive book that will be available for immediate download by artists all over the world. It will be available through Amazon.com and readable on Kindle readers, iPads and other devices with Kindle software. Publishing as an eBook will also allow me to greatly expand our Gallery section to include many more inspiring works by artists from several countries. Choosing the artists for the new edition of Embracing Encaustic was challenging job, but in the end I selected 70+ pieces from over 150 artists who submitted work. Because of the file size limitations for downloading an eBook many fine works could not be included in this edition. Some tough decisions had to be made, for example, where images simply wouldn’t reproduce well because of the palette or size of the work or where two artists work were too similar to include both. If your name is not included on the list of artists below, please don’t be discouraged as it was impossible to include all the deserving artists. 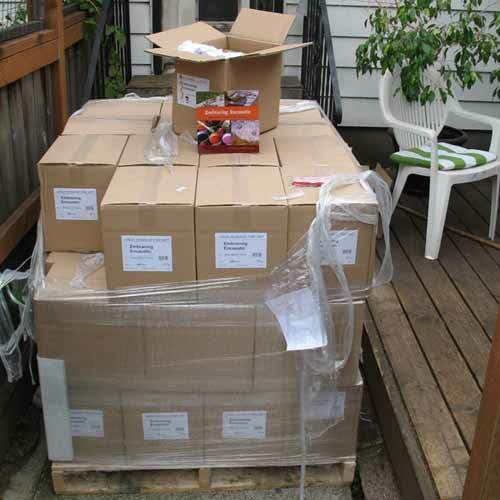 Today I received the shipment I’ve been waiting for, just over 2,000 more copies of my book, Embracing Encaustic: Learning to Paint with Beeswax. I was anxious to get them because I was down to a mere 60 books from the previous two printings, but NOT anxious to get them all down the stairs to my basement for storage. Ugh. Sometimes I wish I had printed a brochure like a normal person. Join me at 23 Sandy Gallery on February 7, 2009 for Working in Wax. This lecture will be a rich visual introduction to the history, tools and techniques of encaustic painting, along with an overview of contemporary artists working in this ancient medium. I’ll share images of several of my paintings as they were being created, showing some of the steps involved in building up the layers of wax and other media. There will also be a screening of Sister Bee, a lyrical and beautiful documentary about six women beekeepers who encounter startling beauty and spiritual truth in their work with honeybees (Running time 30 minutes). Tickets are $10 and are available in my studio or by mail. Limited to 25 people. Nina added dried flowers as the finishing touch on her very first painting ever! Busy, busy, busy. What a great weekend! I held a Beginning Encaustic Intensive class on Saturday with two of my 6 students, a mother and daughter, flying in from California to join in on the fun. I’ve had people come from all over recently including Florida, Pennsylvania and Colorado. I’ve also made some great new friends in various parts of Canada, who now come down for workshops whenever they can. I even had an inquiry from Guatemala last week! I feel so international. On Sunday I headed off to see friends showing their work in Portland Open Studios which left me inspired and ready to paint! The beautiful weather may have worked against some people as we Oregonians are gearing up for rain this time of year and expect every day of sunshine to be the last one we see for months. I made a special trip to see my friend Sara Swink as we’ve just found our work will be paired for a show at Guardino Gallery next November (that’s 2009). 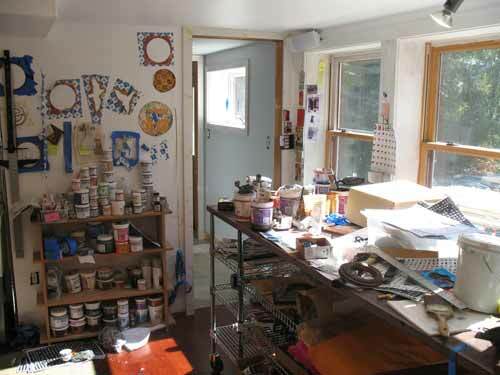 I had never been to her studio before so it was even more exciting to visit with her and see her new work. I’ve been a fan of Sara’s for a long time so I’m thrilled to be showing with her. I also caught up with Erin Leichty whom I met while I was taking a workshop at Oregon College of Art & Craft. Erin is a mixed media artist who sometimes works in encaustic as well, but has given it up until her new baby arrives next week. 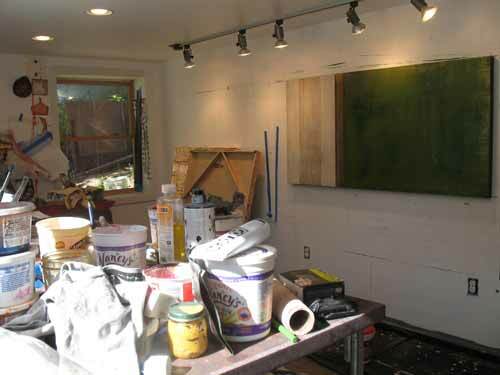 That’s a peek at her studio above. Thank goodness a new shipment arrives today! Today (Monday) I’m stuck in the cold, dank house (see, the weather did change as we feared!) 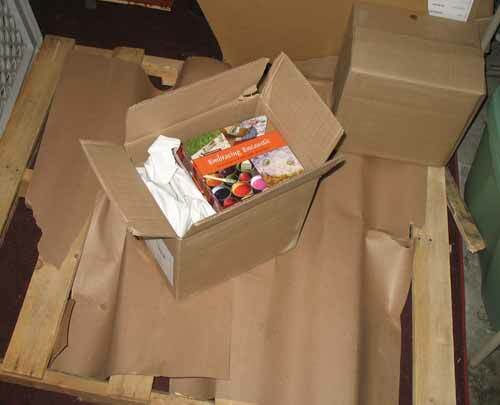 awaiting the arrival of my second order of Embracing Encaustic books. I have 1,500 pounds of books due to arrive today so we have to be ready to get them out of the rain and into the basement. it’s not a moment too soon though, as I only have just over 1 box of books left. Thank you all so much for your enthusiasm in making this book a success! “The Womacks are an artistic married couple that have come together to make a very readable how-to art book. Embracing Encaustic is a beautiful, fully illustrated how-to guide with step-by-step demonstrations on encaustic painting.” Read the full review. Thanks Alina! I’ll admit it, I was a little hesitant about applying for the Kay WalkingStick Critical Feedback Workshop. I hoped if I could get in I would get valuable information from her that I would not likely have a chance at again. I was right. Kay accepted only 10 people from the pool of applicants and I was honored to be one of them. On Monday we gathered in the assigned room, all feeling a little nervous with our art and souls laid out for her to review. She had asked each of us to bring a CD of our work, but also at least one actual piece, explaining that you just can’t have a substitute for seeing, smelling and feeling the work. 3. What are you looking for when you go to look at art? Does your work fulfill that need? 4. Who is your favorite artist and what do you expect their art to do for you? 5. What subject do you want to investigate? 6. 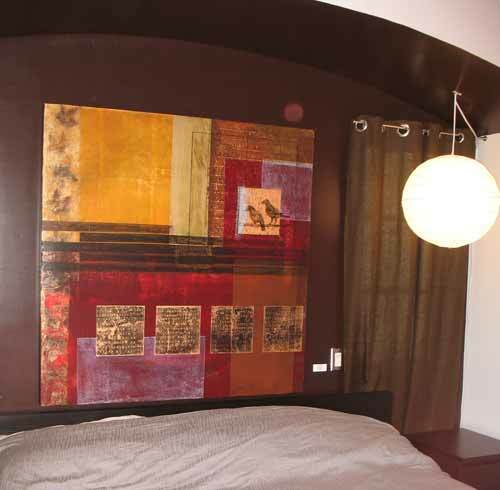 How to do conceptualize your work? How do you begin (through color, image, idea)? 7. How are your pieces related to one another, if at all? 8. What symbolism are you trying to convey? 9. Who is your audience? What do you want your audience to see? Later in the day Kay met with each of us individually and I was thrilled (and relieved!) to hear that she heartily encouraged my plans for a new series (based on the work above) and helped me focus the path I’ve laid out for the next several months. When asked if I should try to work some of my ideas out on paper versus complete paintings she said, “Don’t just work the ideas out any way you can, work them out EVERY way you can.” Excellent advice. I feel like I now have new tools for evaluating my own art and how to become more focused in my work. For those of you in Portland, please come celebrate with me in my studio with a book release party this Friday. I’ll have champagne and chocolate on hand, along with a few of the other artists who have work in the book. The Hive, 5417 SE Stark St.
Here’s a map to my studio, which you enter from SE 55th. Feel free to pass this invitation on to friends. Please RSVP so I know how many people to expect, though if you decide to come at the last minute I’ll always be happy to see you. Can’t make this party? There will be more on both coasts. 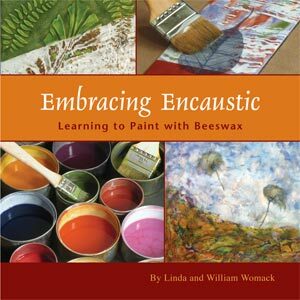 See the list of additional book release parties for Embracing Encaustic. 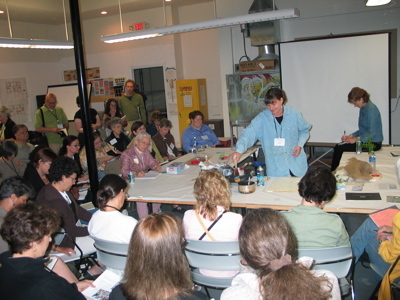 The next party will be in Beverly, MA at the National Encaustic Conference. 1. 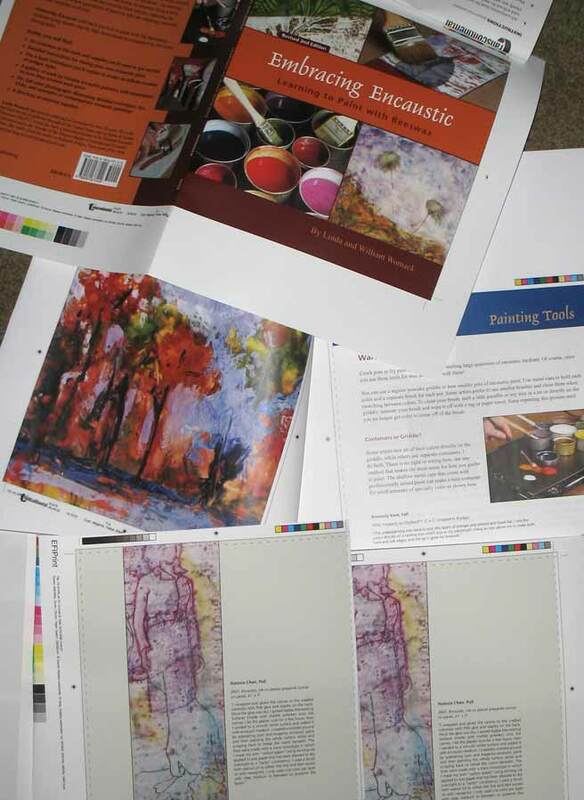 My fabulously talented husband, Bill, is a writer and the other author on Embracing Encaustic. Trust me, you will be very grateful for this fact. (BTW, he also took all of the photographs that have my hands in them! Well, except for that one shot when he wasn’t home and, well, it wasn’t pretty.) But the point is that he is a wonderful writer. 2. Life has not slowed down while we tried to get this book out. All of the show deadlines, grocery shopping, doctor’s appointments, family drama and tax bills (see drama) just kept on coming no matter what the designers or printers needed by deadline. I mention this because these two facts recently came together to make possible this wonderful post on my husband’s blog, Words for Writers. Enjoy The Ripple Effect, which describes the excitement we had outside our house recently. Oh yeah, and all the police cars. Embracing Encaustic is off to Press! I received the first press proofs of my revised book yesterday and they looked better than I ever imagined! The resolution is so good that you can see brush strokes in many of the works and the color is brilliant. I was especially interested in seeing the work of my 25 guest artists, as those are all new to this edition of the book. In addition to sharing their work in the book, each artist also shares some insight into how the work was created, often sharing surprising tips and tricks along the way. I think this is my favorite aspect of the new edition. These artists have been so generous in sharing their knowledge! 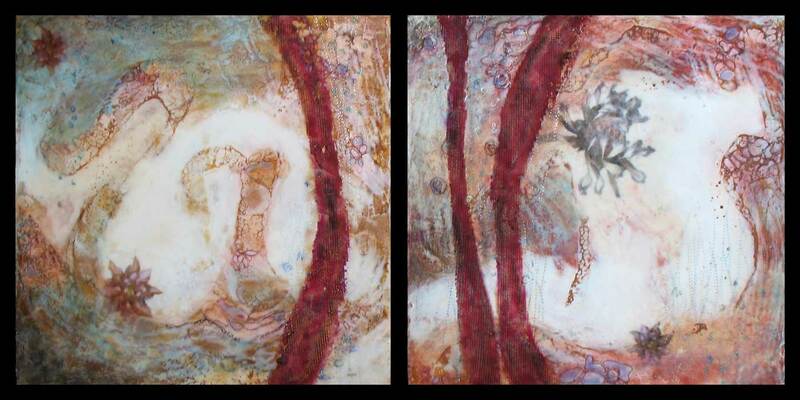 To view more work by each of these artists visit www.embracingencaustic.com for links to their web sites. I’m expecting the books to arrive by the end of May. I’ll announce it on this blog when they are available for purchase! 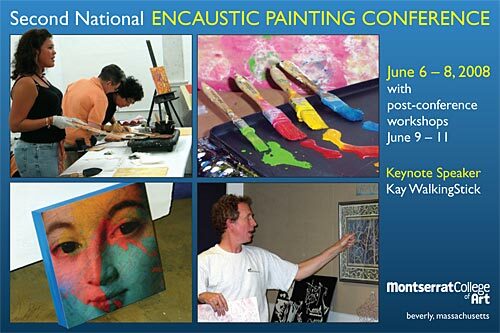 The Second National Encaustic Painting Conference will take place at Montserrat College of Art, June 6-8, 2008. Montserrat is in Beverly, Massachusetts, a coastal town north of Boston. Last year there were 140 of us from around the country (and beyond!) who attended panels, demonstrations, talks, an art opening (Hot Stuff, juried by Zola Solamente of Arden Gallery in Boston), informal gallery discussions, and plenty of networking. My blog posts provide a good overview of the event. This year they expect the conference numbers to double, so if you are interested in attending you should make your decision as soon as possible. 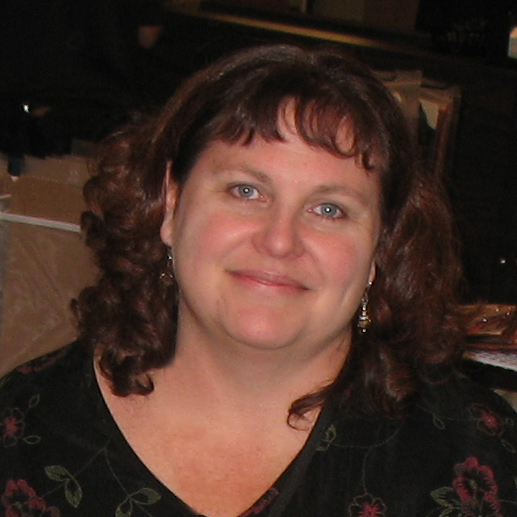 I’m also pleased to announce that Joanne Mattera (author of The Art of Encaustic Painting) has asked me to participate in the conference by doing 2 demonstrations and a book signing for Embracing Encaustic: Learning to paint with beeswax. 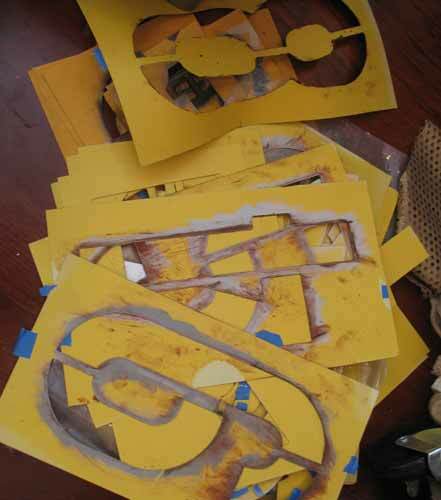 My demonstration will be on Painting with Masks and Stencils to Develop the Image where I will reveal some of my favorite stenciling and masking techniques for protecting one part of the canvas while working on another. 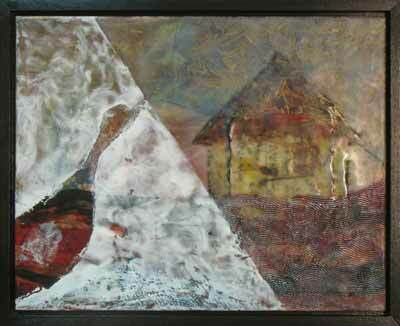 I use ordinary household materials to make marks and textures with my wax to form lines, shapes and imagery. For example, in the work shown here the shape of the bird was cut out of cheesecloth which was then used to mask the layers below as the white wax was applied, giving the piece much more depth than if I simply painted a bird. Using masks offers a simple way to develop striking forms using nothing but wax. I’ll also have a binder with images from many other artists that will also include notes on how they use masks and stencils in interesting ways. It’s my low-tech answer to not being able to do a slide show AND a demo in the same hour. My demo will be offered twice, in both the Saturday and Sunday conference roster. I hope to see you there!